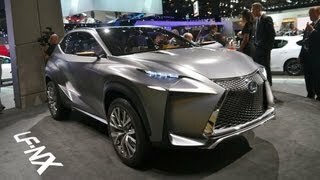 Lexus has revealed a new compact crossover concept, the LF-NX, at the 2013 Frankfurt Motor Show in Germany. 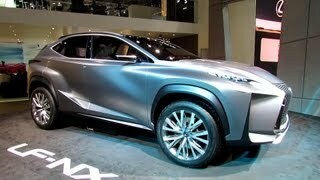 The 2013 Lexus LF-NX concept’s exterior design reflects a further evolution of Lexus’ L-finesse design language. It gets a spindle grille on the front, signature front lighting, Daytime Running Lights and a unique corner styling. The rear features highly articulated lamp clusters. The Lexus LF-NX concept is finished in a new Brushed Metal Silver exterior color. The interior has a driver-focused cockpit within an ergonomically ideal environment. The cabin features the ideal, upper display zone and lower operation zone dashboard format perfected over successive Lexus generations. It gets Sunrise Yellow / Black leather upholstery with contrast stitching, and sophisticated blue instrument lighting. 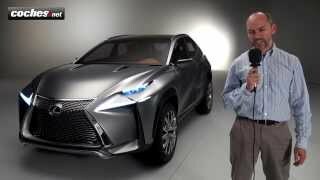 The LF-NX concept is powered by a new variant of the Lexus Hybrid Drive system tuned for SUV performance.